Korean Dwarf Lilac This shrub is an ‘Idaho Preferred’ Plant. Korean Dwarf Lilac is a beautiful lilac that has spikes of fragrant lilac-purple flowers in late spring. The small dark green leaves are smaller than other lilacs and emerges burgundy in the spring. In the fall, the leaves take on a reddish tinge. Korean Dwarf Lilac likes to be planted in full sun. 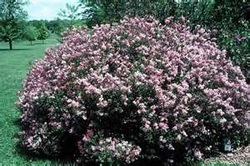 This is a dwarf lilac that grows to a height of 4' to 5' tall and 8' to 10' wide. The dwarf size is great for that small area that needs some brightening up. Korean Dwarf Lilac is drought tolerant and a Firewise plant. This is a relatively low maintenance shrub which attracts butterflies, hummingbirds, and bees. Use Dwarf Korean Lilac for an informal hedge, screening, in a cottage garden, or mass plantings. The flowers are excellent for cutting.